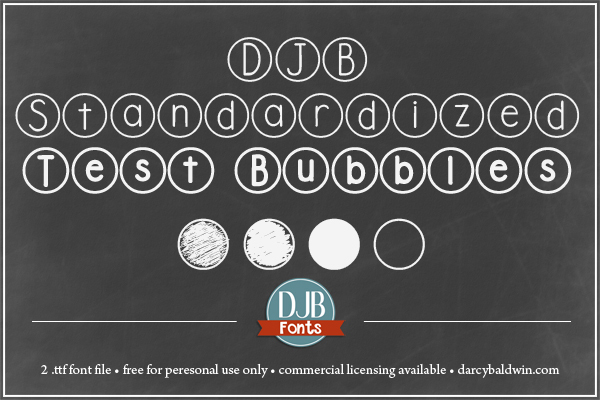 DJB Standardized Test Bubble Font — PENCILS DOWN! TEST OVER! A font for teachers to create practice test sheets, or just a fun circle font for everyone else! Free for personal use – commercial licensing at DJB Fonts. This file contains two .ttf files with a full alphabet, numbers and most common punctuation with 4 standardized test bubbles. It is free for personal use (not-for-profit). If you have a question about what constitutes personal use, check out this info or contact me with questions. If you would like to use this for your commercial/professional ventures, please purchase a commercial use license here. For your records, be sure to include the name of the font you are purchasing the license for. Alternatively, you can purchase the license at Creative Market or purchase the webfont at FontSpring. The two font families require separate commercial licensing. 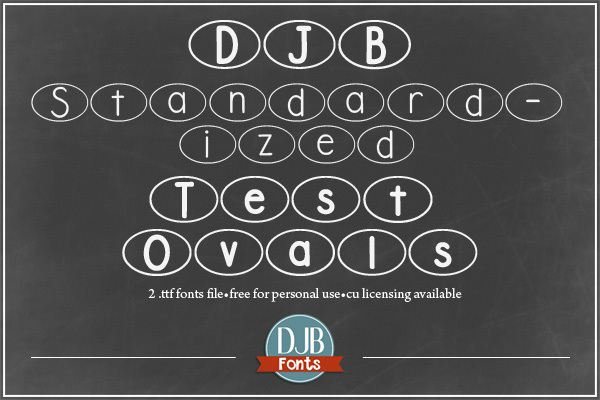 DJB Standardized Test Ovals Font — PENCILS DOWN! TEST OVER! A font for teachers to create practice test sheets, or just a fun circle font for everyone else! Free for personal use – commercial licensing at DJB Fonts.